Champagne and wine lovers can enjoy a little piece of history while storing their collection---with a nod to history and some classic, vintage style---by creating their own riddling rack. The "Riddling Rack" dates all the way back to the early 1800s and was used in the process of creating Champagne. Today it is lovely way to display wine and many connoisseurs use it to store bottles at a proper angle. According to cellarraiders.com, wine bottles should always be stored either horizontally or at the 45º angle with the cork facing down ---an angle which a riddling rack can provide. This keeps the wine in contact with the cork making sure that air cannot get in the bottle. And, as a conversation piece, it does a good job as well. 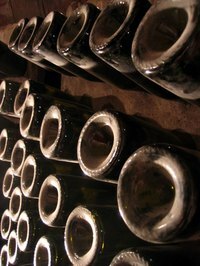 Bottles of newborn champagne begin life stored on their sides in cavernous cellars in Champagne, France, before being moved to riddling racks---which are vital to the method of creating Champagne. The process of "remuage," or riddling, collects the yeast and sediment and concentrates it close to the bottle's mouth. The riddler rotates every bottle a few scant degrees daily, raising the bottom slightly and increasing the angle of storage, and the professional riddler can handle up to 40,000 bottles every day. The process ends with bottles being placed in a sub-zero solution for several minutes. This forms an ice plug with the yeast and unwanted sediments that is then disgorged prior to corking. The result, exquisite bubbles and taste. Traditionally created from French Oak, the rack is made of two rectangular boards hinged together at the top. Each side then has a series of bored holes, cut to hold the neck of a champagne bottle at an angle. The traditional number of holes is 120, however modern interpretations allow for more and less---and even tabletop versions are available for purchase online. However, if you have some basic workworking tools and a few days to spare, you can create one to suit your own space, tastes and that can perfectly hold and display your wine collection. Woodworking: Cut oak planks to suit your specific size requirements. Drill 2.5-inch holes, equally spaced with your drill press table set at 30 degrees. Round all edges, if desired. Finishing: Round all edges, if desired before staining or painting. Use a piano hinge to connect the top and simple pieces of chain to stabilize the bottom and acquire a 45-degree angle for proper wine storage.